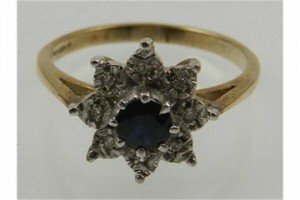 A mid 20th century 18ct gold and platinum sapphire and diamond three-stone ring. 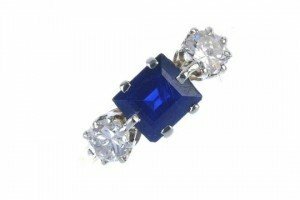 The square-shape sapphire, with brilliant-cut diamond sides, to the plain band. Estimated total diamond weight 0.40ct. 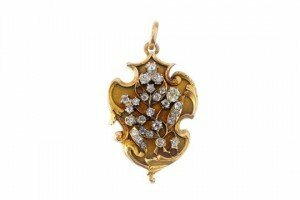 An early 20th century Russian gold diamond locket. The front designed as an old-cut diamond floral motif, with foliate outline, suspended from a plain surmount. Estimated total diamond weight 2cts. 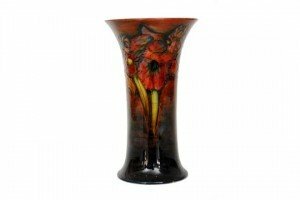 A Moorcroft Flambe Frilled Orchid pattern trumpet vase of flared form decorated with tube lined flowers and foliage to a red wash ground, impressed mark and monogrammed in blue. 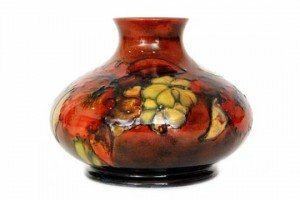 A Moorcroft Flambe Frilled Orchid pattern vase of compressed form decorated with tube lined flowers and foliage to a red ground, impressed mark and monogrammed in blue. 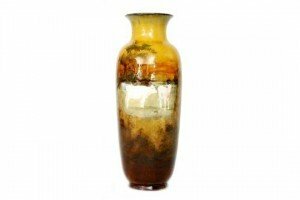 An early 20th Century Royal Doulton Holbein ware vase decorated by W. Hodkinson with hand painted cattle in a field. 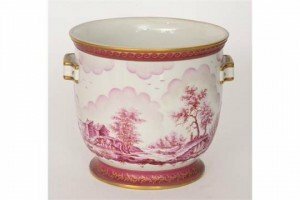 A Continental twin handled jardiniere decorated with a cerise landscape and castle ruins, decorated in the round, bears underglaze Sevres mark and in script ‘modele et decoration exclusive a la main’. 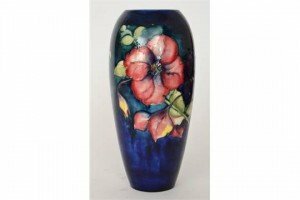 A large Moorcroft vase of tapering form decorated in the Clematis pattern with large tube lined flowers and foliage against a dark blue ground, impressed mark and initialled in blue. 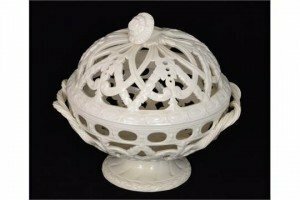 A 20th Century Wedgwood Queen’s Ware Chestnut or Orange basket, the body and domed cover with pieced and incised decoration, the knop formed as a shell. 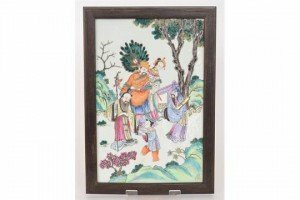 A Chinese hardwood framed porcelain panel decorated with three robed male figures carrying a staff, ruyi sceptre and a scroll with a lady behind carrying a peacock feather fan and a small child being offered a peach, all to a landscape setting. 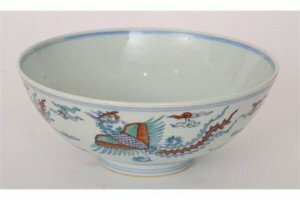 A Chinese footed bowl decorated to the exterior with stylised long tailed birds flying amidst clouds, the interior with a similar roundel, bears six character Yongzheng mark within a double ring border. 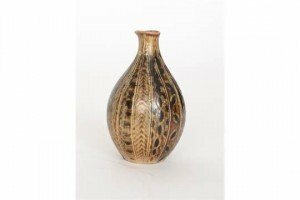 A late 19th Century Doulton Lambeth stoneware vase of gourd form decorated with incised vertical lines with chevron bands and mottling. 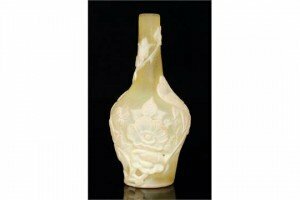 A late 19th Century Stourbridge cameo glass vase of shouldered ovoid form with a slender collar neck, cased in opal over citron and deeply cut with a flowering wild rose bough. 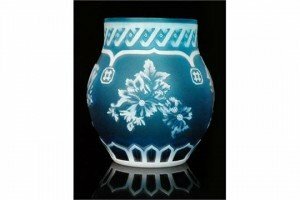 A late 19th Century Stourbridge cameo glass vase, possibly Stevens & Williams of swollen ovoid form with shallow collar neck, cased in opal over blue and cut with Oriental style flowers between stylised borders. 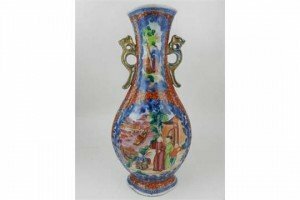 A 20th century Chinese blue and iron red twin-handled vase, decorated with vignettes of figures by a river, having ornate floral and geometric decoration. A 9 carat yellow gold, diamond, and sapphire floral cluster ring, the round cut central sapphire surrounded by diamond accents. 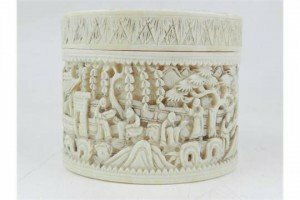 A late 19th / early 20th century Cantonese ivory lidded box, of oval form, having ornate carving depicting figures amongst trees. 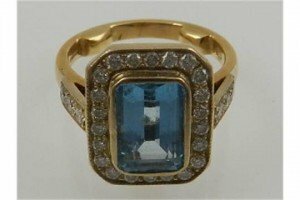 An 18 carat yellow gold, diamond and aquamarine dress ring, the emerald cut aquamarine surrounded by round cut diamonds, having round cut diamonds to shoulders. 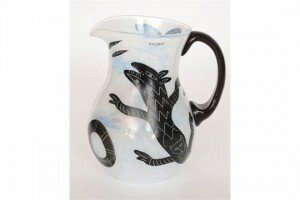 A later 20th Century Kosta Boda water jug of swollen ovoid form with a loop handle, decorated with hand enamelled abstract animals in black over a mottled white ground. 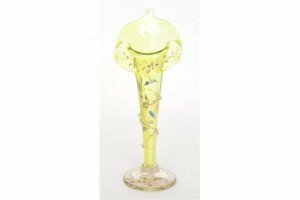 A late 19th Century Stourbridge glass Jack in the Pulpit vase with domed clear crystal foot below a fluted citron yellow trumpet, enamel decorated with wild birds, flowers and foliage. 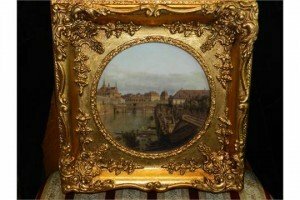 A painted porcelain plaque depicting a rural townscape, within an ornate giltwood frame.